Popcorn ceilings. While most people are amused by this “dated” ceiling application, the truth is that this material is still very prevalent to this day. Popcorn ceilings are commonly found in homes across the United States, but some businesses located in older buildings may find themselves stuck with this economic trend. This material was in heavy use for nearly 50 years, but recent innovations and product-specific dangers have made popcorn ceilings a thing of the past. AZ Drywall Finishing is here to serve as your trusted commercial drywall company for every project. For nearly 20 years, our drywall contractors have helped Chicago businesses to achieve amazing results at an affordable price point. We know how to match every industry-specific need, and understand exactly what is required to make your space thrive! 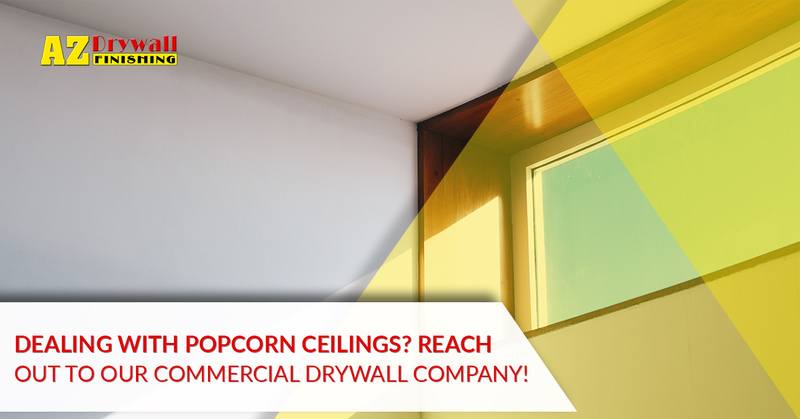 Today, we’ll discuss a few dangers and drawbacks of popcorn ceilings, as well as the value that our commercial drywall company can provide for any project. Be sure to contact us when you are finished to learn more about our drywall installation and finishing services! Acoustical benefits — Before our modern acoustical ceiling tiles were available, many homes and businesses relied on the structure of their popcorn spray to break up and block sound transmission. Clean appearances — Bright, white, and affordable, popcorn ceilings were an easy answer to achieving a clean look for many homes and businesses. Easy installation — While our drywall finishers focus on delivering high-quality textures and paints for your walls, the ceiling is a different matter entirely. Coverage of mistakes — One advantage that made popcorn ceilings more popular is the fact they this spray can cover a range of imperfections. Drywall contractors can cover any mistakes, leaving a uniform layer of texture over the existing wallboard. One of the biggest concerns with your establishment’s popcorn ceiling is the risk of asbestos exposure. This mineral substance contains long, thin, fibrous crystals that are comprised of millions of microscopic fibrils. When inhaled, this material can infiltrate and inflame your lungs, creating a host of breathing problems. Individuals exposed to heavy amounts of asbestos will likely suffer from a number of health problems, including stomach problems, shortness of breath, lung cancer, and more. The Environmental Protection Agency banned the use of asbestos in popcorn ceilings in 1977. However, any projects started before or near that time were not upheld to the same rules. Additionally, any existing stocks of asbestos-containing products were allowed to be sold to reduce economic hardships. If your building is from this era, it may be time to oust that outdated ceiling! While popcorn ceilings were ideal for hiding previous imperfections, any new damages sustained will result in ugly appearances. Home- and business-owners alike will face a tough time trying to patch or repair their popcorn ceilings. In many cases, an entire replacement will be the only answer. AZ Drywall Finishing is here to deliver complete drywall installation services, and can work with you to find the best fit for your building. Keeping the ceilings in sterling condition can also be a monumental challenge, as these pristine surfaces can yellow and fade over time. Even if you do not smoke in or near your popcorn ceilings, there may still be discoloration. Minor touch-ups may prove impossible, and any maintenance done may result in a mismatched ceiling. This outdated ceiling component was used as an effectively affordable way of creating quality surfaces without worrying about perfection. Drywall finishers could simply apply this thin layer of material and go, avoiding the demands of perfecting a smooth, seamless ceiling. Popcorn ceilings can be nearly impossible to upgrade, as this textured material does not hold paints well. Professional applications can help to maximize the quality of your painted popcorn ceiling, but keep in mind that you will likely be left with numerous gaps and mistakes. Additionally, heavy moistures can soften the popcorn elements in your ceiling, causing them to liquify and drop onto the floor. This mess can cause more harm than good. Ultimately, popcorn ceilings are not worth the effort! Today, popcorn ceilings are seen as unhealthy, high-maintenance, and out of fashion. If you’re looking for a quality solution for your ceilings, or you’re in need of assistance from an experienced commercial drywall company, AZ Drywall Finishing is here to help! Our highly experienced drywall contractors deliver amazing results across Chicago, and we’re sure that we can achieve an ideal fit for your project. Contact us today to learn more about our drywall installation and finishing services!